No game or movie night would be complete without homemade popcorn in our house. It’s an easy treat that takes about 5 minutes to whip up and you can use so many different toppings. 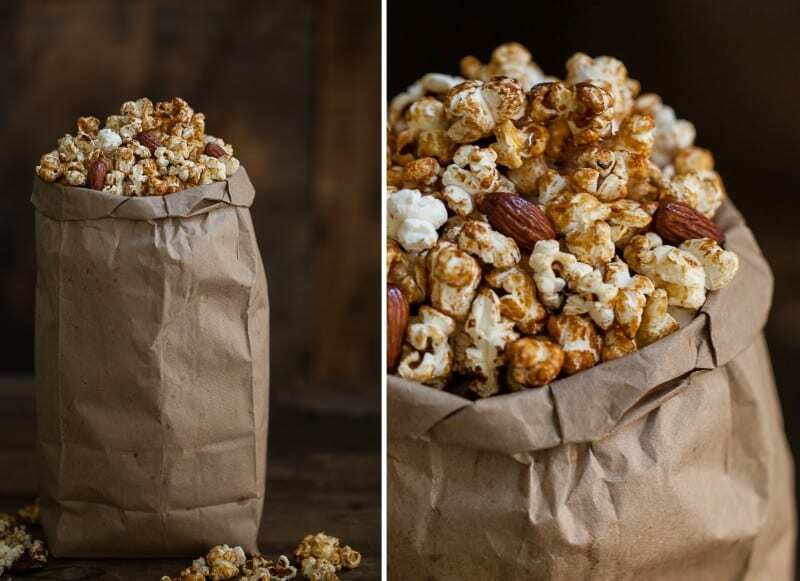 Homemade popcorn is one of those things that you really don’t need the store-convenience, microwave popcorn bags. All you need is a stovetop and a good-sized pot with lid. 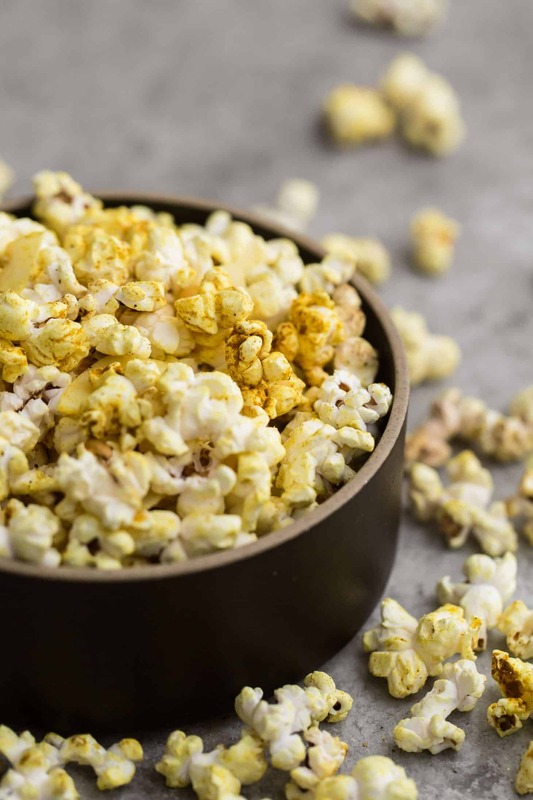 This particular curry popcorn variation is one of the easier recipes we do and it’s all dependent on having a good-flavored curry powder. Remove from heat and add the coconut flakes, coconut oil, curry powder, and ginger powder. Put the lid back on and shake vigorously until popcorn is well coated. Cover with lid and shake vigorously for 10-15 seconds. Serve immediately. Curry Variations: I love playing around with different curry spice blends (there’s a lot of variation from one curry powder to the next). A few different ones to check out include Jamaican, Japanese, or Madras. Sweet: We like to occasionally make homemade kettle corn by adding a bit of cane sugar to the melted coconut (before adding the corn). Try adding 2 to 3 tablespoons of cane sugar before popping- it adds the perfect amount of sweetness! Spicy: If you pick up a curry powder that isn’t spicy but want that kick, try adding a pinch or two of cayenne to the mixture! First published on February 13th, 2012. Last updated on April 1st, 2017. I love, love, love this idea. Especially with a good and spicy curry powder…the perfect combo of spicy and sweet! I’ve been using this Thai Curry Powder I got from a spice shop and it’s sooo good! Sounds delicious! Definitely a flavor combination I wouldn’t have thought of myself, but am excited to try now. 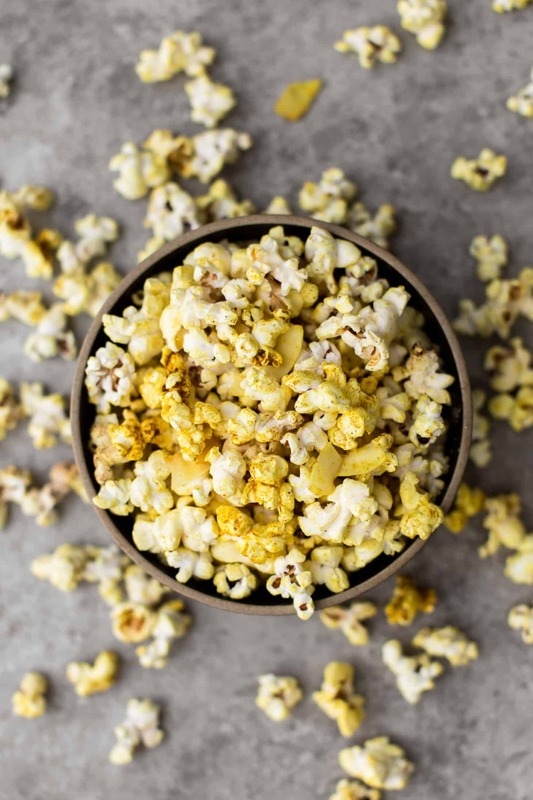 i always pop my popcorn in coconut oil bc i like the flavor it adds–i need to try adding curry powder next time! Yum yum yum. I cooked my popcorn directly in coconut oil. Next time I’ll drizzle in some more with curry powder like you did here. I didn’t even think to cook it in the coconut oil before hand but that’s definitely what I’ll do next time! How do you cook it in coconut oil? i’d like to learn. Usually coconut oil or sunflower oil! 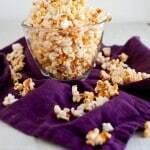 I just confessed on Kate’s blog today that I’ve never actually made my own stove top popcorn (hangs head in shame) I didn’t think it could get better than the chocolate + spice version she had but coconut + curry sounds equally delicious! I’m al little ashamed to say that Rachel Ray was actually the one that saved me from my store-bought popcorn experience. But it’s the change of heart that counts! I cooked mine in coconut oil but I was disappointed that it didn’t taste very coconut-ey. I like your idea of drizzling it on top and adding the toasted coconut flakes. I am absolutely addicted to coconut curry- so good! I wish I could have participated this week because it’s been so fun seeing all the crazy popcorn flavors! This might be the craziEST though. And, coincidentally, one of my favorites. I love all things curry all the time. This looks so cool–ultimate gourmet/exotic popcorn! Question: how do you keep your popcorn hot? Whenever I mix my own popcorn it gets cold by the time I serve it! I added 1/2 Tbl of coconut sugar (like brown sugar, but slightly nutty and toasty tasting) to my ginger curry coconut oil and it was AMAZING! Like curried vegan kettle corn. Best. Snackfood. Ever. Hi Erin, If you like Curry Powder I bet you would like it with Garam Masala seasoning too (You can find it on Amazon for around $5.00). Let me know what you think. Hi Steve- Garam Masala is up there as one of my favorites too! I don’t use it as often as curry powder but it’s still a staple in my kitchen! Hi Erin, I love curry, coconut oil and ginger, but I never tried mixing them up. So I had to try out this recipe. I made it while watching the video. And OMG, this was GOOD. Thanks for the idea. MMMMMMmm! you had me at curry…..oh and popcorn!